Near Marseille, on an islet in the Frioul archipelago, a historical castle is located. Its fair walls seem to be even more blinding because of the sun and the boundlessness of dark blue sea water. Looking at this majestic building, literally merged with the snowy-white rock on which it had been built, it is hard to believe that this is one of the darkest prisons in the world – the legendary Château d'If. Over several centuries, approx. 3,500 prisoners were put in its dungeons, including criminals, remarkable politicians and famous courtiers. However, a novel by Alexandre Dumas brought a worldwide fame to only one of them and made the castle itself extremely popular. A story about the fictional escape of Edmond Dantès makes the fortress of If a romantic place for today's tourists. To them, this fortification is not a terrible prison but quite the contrary – a symbol of noble vengeance of the count of Monte Cristo against slanderers and envious people. This small island in the Gulf of Lion, which today is clearly visible from the Corniche roadway running along the seaside, had already been well-known in ancient times. In one of the historical chronicles describing an Emperor’s voyage, there is a mention about the If island which made a bad impression on him. This rocky island was often a hiding place for pirates, criminals and other individuals like that. For them, it was a shelter to escape justice. Who would have believed that after many centuries this island would have been crammed full of criminals again. However, this time they were cuffed and deprived of any hope to escape. 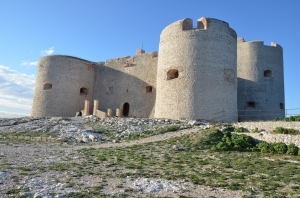 The historical appearance of the Château d'If remained nearly fully intact, apart from the damage of upper storeys and the inner courtyard, which were built during World War II. After a renovation, tourists were able to see how the castle looked like when those miserable prisoners had been imprisoned there many centuries ago. The highest building in the fortress is Saint Christopher tower, erected between 1524 and 1527, used for controlling the maritime area. The tower is connected to a wide bridge forming the inner courtyard of the castle with another two impressive building – Saint Jaume tower and Maugovert tower. From this slightly small inner courtyard, which looks like a well, there are several steps running to arcaded terraces where entries to the casemates and the dungeons are. The cells on the upper floor were used for rich and famous prisoners, who were able to pay for their "stay" and for additional benefits such as taking a walk outside or good food. The cells had small windows through which you were able to see a limited sea view, sometimes there was even a fireplace. Prisoners from the poorer social class were kept on the lower floor, in the basement, in cells which looked like hollows curved in rock. The sunlight did not reach there at all, in wintertime the temperature was very low, while in summer stuffiness was unbearable. Today, near the entries to many of those cells, there are notices attached, informing about names of famous prisoners and dates when they were imprisoned in the Château d'If. Undoubtedly, Edmond Dantès' cell is the most popular. It was made by the museum staff to the satisfaction of tourists, despite the fact the count of Monte Cristo is a fictional character. A romantic story about the escape from this dreadful prison is only Alexandre Dumas’ fruit of work. 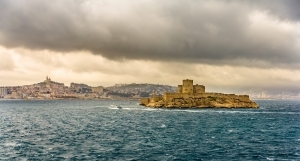 In fact, when the Château d'If served a prison, nobody managed to escape from there! 17 September - 31 March – every day, excluding Mondays, between 9:30 and 16:45. 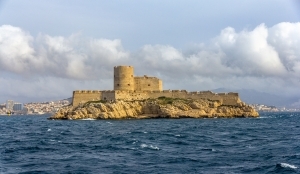 On 25 December and 1 January the Château d'If is not available for tourists.